I have been interested in the history of palliative care for over 20 years. I first got going on this work with Neil Small by conducting interviews with hospice founders in the United Kingdom and we then collaborated with Michelle Winslow and Nic Hughes on a general interest book about hospice pioneers. Later I worked with Michael Wright and we extended the range of these oral histories to over 60 countries of the world. I then did a book with Michelle Winslow to mark the centenary of St Joseph’s Hospice, in Hackney, East London. Along the way I edited the papers and letters of Cicely Saunders and wrote in some depth about the history of St Christopher’s and the hospice movement. Looking back it was all preparation for a request which came to me out of the blue, from Oxford University Press in 2012. Could I write a book for a new series to be called Oxford Medical Histories? It was specifically to be a book about palliative medicine and would sit alongside other volumes that would be about histories of other medical specialties, particular diseases or rmedical techniques. I was intrigued, but whilst I wasn’t quite sure how I would find the time, since I was still Director of the University of Glasgow, Dumfries Campus at that point, I said yes and got down to writing a full proposal, When it was accepted a few months later, reality kicked in. I had a contract for a book of 100,000 words which would cover the history of palliative medicine spanning almost 200 years. It was a daunting prospect. Four years later, I am delighted to say the book is now out. 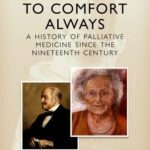 It is entitled To Comfort Always – a history of palliative medicine since the nineteenth century. Palliative medicine was first recognised as a specialist field in 1987. But as early as 1826, medical theses were appearing that focussed on the challenge of ‘easeful death’ and sought to map out the principles of practical, spiritual and medical support at the end of life. In the long intervening period a major process of development took place which led to new approaches to the study and relief of pain and other distressing symptoms, as well as a growing interest in ‘holistic’ care for those with advanced disease, and a desire to gain more recognition for care at the end of life. My book traces this history of palliative medicine, from its nineteenth-century origins, to its modern practice around the world today. It takes in the changing meaning of ‘euthanasia’ in that time, assesses the role of religious and philanthropic organisations in the creation of homes and hospices for the dying and explores how twentieth-century doctors created a special focus on the care of those for whom cure or recovery is not possible. It takes in the rise of clinical studies, academic programmes and international collaborations to promote palliative care. It examines the continuing need to provide evidence in support of the specialty’s development. It assesses the dilemmas of unequal access to services and pain relieving drugs, as well as the periodic accusations of creeping medicalisation within the field. The first history of its kind, it concludes with some reflections on the achievements of palliative medicine to date and the challenges that remain. It has been a huge amount of work for me, greatly helped by many colleagues, friends and family members, all of whom are acknowledged in the opening pages. In the coming months I will be speaking about it at a number of seminars, conferences and literary festivals. Please let me know if you want to discuss other opportunities where I can share what is to be learned by studying the history of palliative medicine, in the context of making sense of where it might develop in the future.